PAS 100, Publically Available Specification for Composted Materials, is a widely recognised standard within the organics recycling sector. It contributes to the concept of the circular economy as the base document for the end of waste criteria for compost. Independent certification against the end of waste criteria (including PAS 100 requirements) means that the material is no longer subject to waste regulatory controls and has achieved product status. More information about the history, development, and purpose of PAS 100 is outlined in this document here. BSI PAS 100:2018 is the current version of PAS 100. PAS 100:2018 can be purchased directly from BSI here or discounted copies are available to purchase directly from REAL. Please send an email to georgia@realschemes.org.uk if you would like to purchase a discounted copy. BSI PAS 100:2011 was published in 2011 after going through a formal revision process. The key changes brought in by the 2011 edition can be found in this document here. PAS 100 was reviewed again in 2016 with BSI and the decision was made to revise the standard so another formal revision process was initiated in 2017. 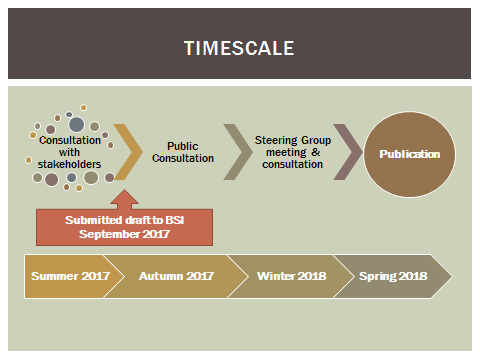 The timescale for this process is shown below and included public consultation on the draft changes. The revision process for BSI PAS 100:2018 is described in this document here. A new ‘compost quality’ clause making clearer the existing requirements to produce compost that is fit-for-purpose (suitable for intended use) by checking and agreeing with customers in writing any quality requirements that are more stringent or wider ranging than the minimum baseline quality requirements specified in the PAS. Requirements for a team approach to developing a Safety and Quality Control System (SQCS).The previous Hazard Analysis and Critical Control Point (HACCP) section of PAS 100:2011 has been re-written to extend the requirements. PAS 100:2018 requires producers to set up a SQCS to consider hazards affecting quality as well as safety, relevant to the intended use of the compost. This also relates to the new ‘compost quality’ clause. A requirement for compost to be re-assessed for compliance with the requirements of the ‘compost quality’ clause when stored for a period of six months or longer. A requirement that restricts the dispatch of sampled batches of compost for use until after the test results have been checked for conformance to PAS 100.